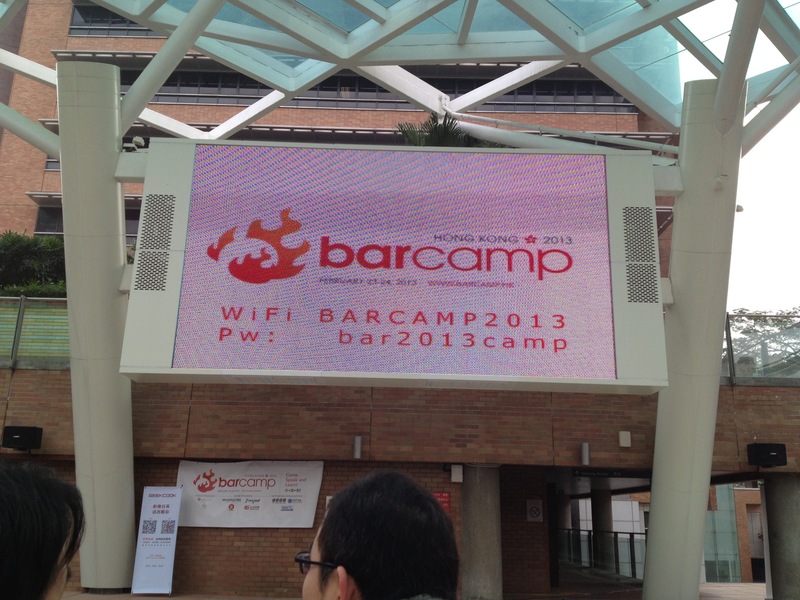 I went to the first day of Barcamp Hong Kong 2013 at HK Polytechnic University on Saturday, 23 February. This was my second Barcamp event. Last year was held all on one-day at City University of Hong Kong. Barcamp is a open-space inspired event where someone with an idea and the desire to talk about it makes a pitch to people who want to listen. The ‘law of two feet’ applies; if it isn’t interesting people can get up and leave for someone else presenting their idea. In practice, people write up very short descriptions of their idea and they are assigned a place to present. People can wander in and out as they like. I got there on time at 9:45am for a 10:00 am start. This is the first time I’ve seen the 3D barcode registration work with iPhones. There weren’t too many people in the big open plaza at HKPolyU Design School with rows of chairs, a very large digital display screen and sound system. People were rather reluctant to sit in the chairs; I think because it had the ominous ‘lecture-look’ that might be difficult to get out away from easily. Perhaps it might have been better to arrange them in circles. By 11:00am people had filled out some half-size sheets of paper with topics and stuck them up on a brick wall. There was some consolidation as people with similar topics joined forces. Last year I seem to remember that each topic was given 30 minutes and it seemed too short. This year 1 hour seemed better but maybe too long for just one speaker. My first topic was ‘Fashion & Technology’. I like clothes I suppose about as much as anyone. I’m interested in why I choose the clothes I wear. HK is somewhat of a fashion centre but it suffers from creative anxiety. HK used to be a centre for making clothes and now is a place for organizing the making of clothes in China and then shipping them around the world. I wondered what these people would talk about it. The speaker was trying to get some sense of what people thought ‘fashion & technology’ should be about. People introduced themselves and why they choose to come to this topic. Most people were not working in the fashion field but were interested in wearable technology. I was somewhat amused when someone presented the new idea of using technology to make ‘custom-made’ clothes. I’m old fashioned and I still use a couple of HK tailors for suits, shirts and casual trousers from time to time. These tailors seem to keep track with big bound volumes where they write down my measurements and what I’ve ordered over the past 24 years. It’s nice when they ask me if I still wear the grey plaid jacket I had made in 1996. I think maybe technology and fashion could be used for custom made clothes but I’m not sure it will ever be as personal and good as an in-person tailor. My second topic was from a grumpy old guy on ‘Lessons from Web 1.0 | That are still true today’. He wasn’t that old but he had been part of that first wave of web-developers in the 1990’s. He now works at one of the large banks in HK on trading algorithms. He made some useful observations that in the Web 1.0 days many plugins and be-spoke browser-sensing approaches were used to improve the web experience. These didn’t work well because most users do not keep their browser up to the latest version with all the appropriate plugins and writing code specific for Netscape, IE and Mosaic very quickly fell-down because it was impossible to test all the possible iterations of OS, hardware and browsers. Guess what? There are now 3 main browsers, IE, Chrome and Firefox and many other smaller ones used widely in specific countries and industries. Many times developers build applications assuming everyone is using the most recent version of Chrome on a high-end personal computer. The application fails and the user walks away. The lesson learned? Do not assume that everyone is a geeky computer person who enjoys hanging out with the PC. Most people do not want to have that much knowledge about the PC. They believe, correctly I will add, the PC should just work without a lot of fuss and bother. He recommended making applications work first with Lynx, a text based browser and then with other browsers. Assume someone in Kenya on a dial-up link is going to use the application. That person in Kenya could be generating 10 cents of revenue and if there are enough of them that could be what makes the application a success. There is an assumption among developers that applications are refreshed and being updated every few years. This is seldom true. Rather than being refreshed applications simply die from lack of use. Useful applications last for a long time and get changed incrementally with the danger that old code is still lurking around and being used as the core for more supposedly advanced applications. In the end, this may cause quite a few problems in the next wave of Web 3.0, 4.0 and 5.0 world. The last topic was Open Data in Hong Kong. The HK government has had the Data.One initiative since 2011 to make datasets available to the public for no cost. First, a developer presented his open source application using the HK Observatory (HKO) data. He hadn’t used the datasets available from Data.One for two reasons. First, he didn’t know the HKO dataset was available and second when he did find out about the dataset it was only a simple RSS text file and was not useful. 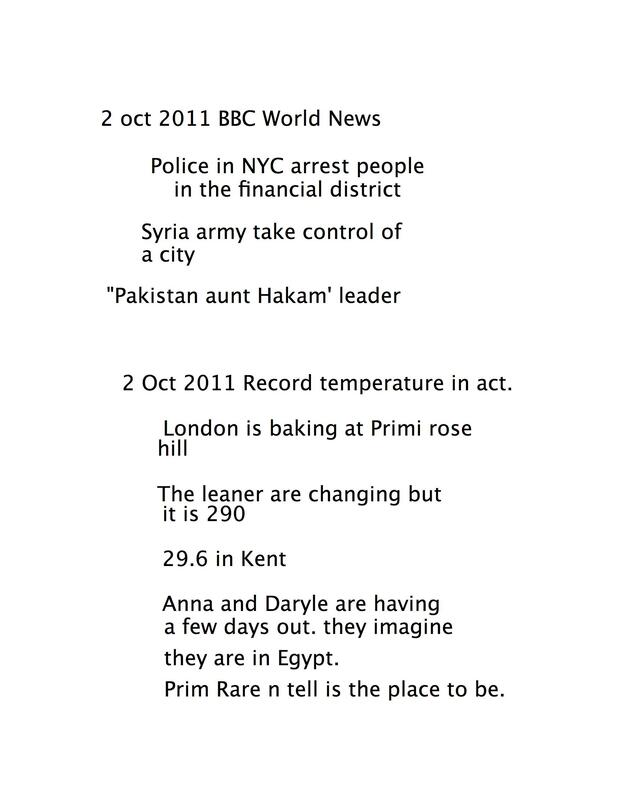 Instead, he simply captured (scraped) the data from the websites maintained by the HKO. Next, someone talked about the Data.One initiative, the background and what was now happening. The gist of it seems to be that the government wants to make datasets available but not much effort if being made to coordinate what, why, how and who. Departmental Administrative Officers (AO) makes the datasets available based on their personal networks. The AO is an important person in the HK government structure but he/she is frequently very over-worked and normally has limited technical IT skills or knowledge. These AO’s have networks inside the government and they use for all sorts of activities. There is nothing wrong with this approach but the Data.One datasets are rather hit and miss. The last person talked about the context of Open Data initiatives in the EU and elsewhere. She said that the most active Open Data initiatives were in Berlin, London and New York. The big question is how to have more knowledge about the datasets and more use of them for application development. After these talks a Google+ group, Open Data Hong Kong, was setup. Hopefully, this may become a platform to promote these Data.One datasets. I went to the Online Information Asia-Pacific exhibition and 2-day conference on this past Wednesday and Thursday, 23 – 24 March, at the Hong Kong Convention & Exhibition Centre, conference program here. There was also a 1-day Business Information Forum which I did not attend. All was organized by IncisiveMedia based in London. I was a member of the ‘Conference Committee’, which means I made some suggestions on speakers, marketing and promotion. The exhibitors were primarily compilers and resellers of information for academic libraries and businesses. Maybe there were 50+ exhibitors. The exhibition was free and there were some free seminars. It seemed to me that there were never more than 50 people at the 2-day conference but someone told me about 100 had registered. Turn-out for both the free exhibition and the conference could have been better but for a first year effort it was quite good. Hopefully, the 2012 exhibition and conference will be better attended. David Warlock, from Outsell, highlighted that the tablet is a ‘game-changing’ device like the IBM PC in the 1980’s. Its 5-year projected adoption rate is faster than any new ‘information’ device. What does this mean for information management? He didn’t claim to know that clearly. For me the big change is in ‘usage’. It’s all about ‘gestural computing’. People expect to be able to manipulate the device with a gesture. By the way, I don’t have any gestural devices but I intend to get my first iPhone4 soon. Bonnie Cheuk, from Citi, focused on the leadership skills to make using Web 2.0 social networking tools work in a large corporate environment. Bonnie has solid academic credentials and deep and successful big organization experience so I listen carefully to what she says. Bonnie has been using Sharepoint at two large organizations to facilitate online interaction, networking and discussion. I would say she is trying to do online ‘Knowledge Café’, ‘Open Space Technology’, ‘Bohm Dialouge’ and ‘Anecdote Circles’. She cautioned about getting over involved in the looking for the ‘best technology’; make what you have work, it isn’t about the technology. She is trying to move away from ‘anything goes conversations’ to focused and structured interactions. Regular, wise use of best suited information to build, change and/or challenge knowledge in support of decision-making, problem-solving, innovation and growth. Louise Pemberton, from Kroll, gave an excellent description of ‘real-world’ information management at a risk and security investigation firm. It is all about guiding the users, training and re-training, setting up the same look-and-feel across the Sharepoint sites and emphasizing that not all information in online. Some information comes from people and there are real skills and techniques to use when asking for information from people. Interestingly, Kroll has tried to use some of the Web 2.0 techniques like blogging and expertise pages and they didn’t ‘have much traction’. This is what I’ve also observed and experienced. Catherine Ruggieri, from Elliott Management, spoke about morphing from a traditional corporate librarian into a hedge-fund Market Data Manager and how she took on the IT Department and won thru persistence and guile. She reminded us all that it’s about making it happen and showing real value to the organization that give information management recognition inside the organization. Steve Arnold, from ArnoldIT, facilitated a to-the-point panel discussion at the end of the first day on the state of ‘Search’. He kept the panel focused and they had insightful answers. It was a good example of running a structured content meeting. For most of this past year I’ve been working on a project that involved searching for Chinese people in various online databases using their Romanized names or their Chinese character names. When you are searching for someone’s Chinese name inside a database there are some quite thorny issues. With the rise of China as the world’s 2nd largest economy and Chinese people traveling and spending more and more around the world these issues about identifying Chinese people by their names are going to become a part of many knowledge workers day-to-day tasks. Here is the definition of Greater China from Wikipeida. Most of the time trying to find a Chinese person among many other Chinese people in a database by name is not very successful. Most of the problems are around ‘Romanization’ and ‘Simplification and Traditional Chinese characters’. If you are interested in ‘Romanization’ see this Wikipeida entry. The ‘Romanization’ problem is that there are simply too many methods and no real standard. In mainland China, people are by law required to use ‘simplified’ characters for their names. This assumes that there is a ‘simplified’ character for that name. In Hong Kong, Macau and Taiwan people use ‘traditional’ characters for their names. If you are interested in the difference refer to this Wikipedia entry. In any event, ‘simplification’ is a master stroke of censorship and knowledge control by the mainland Chinese government. Mainland Chinese have difficulty reading books, pamphlets and newspapers from outside of China. What better way could there be of controlling knowledge than by changing the writing system people use every day? Conversely, people from Hong Kong, Macau and Taiwan have a difficult time reading ‘simplified’ characters. Some claim it is harder to go from ‘Simplified’ to ‘Traditional’ than from ‘Traditional’ to ‘Simplified’ but I’m not sure. Reading Chinese is always hard for me and I’ve learned both character sets, sort of, up to the 1,000 character mark. However, since there are different character sets a problem arises when someone from mainland China comes to Hong Kong, Macau or Taiwan and start to use their written character name to open accounts at banks, shops, hotels and so on. The same happens when people from Hong Kong, Macau and Taiwan go to mainland China. Simply put, people can’t easily read this person’s name. The solution is to ‘transform’ the name into the ‘correct’ character set; ‘Simplified’ Character to ‘Traditional’ Character or ‘Traditional’ Character to ‘Simplified’ Character. It happens all the time when a person opens an account where there details will be input into a database. They write down their name in the character set they are comfortable with using and the person either collecting the names or the data-input person ‘transforms’ this name. Interestingly, all Hong Kong and Macau Chinese people may apply for a ‘home return permit‘ card that lets them cross the border into China easily, and also lets the Chinese government know they have arrived. Their names are always ‘transformed’ into simplified characters when there is corresponding character between the ‘traditional’ character and the ‘simplified’ character. I assume these transformations are more accurate than some of the others. I know some of the transformations between ‘simplified’ to ‘traditional’ are not always accurate. This is due to imperfect knowledge of the mapping rules between the character sets. Sometimes people are in too much a hurry so they simply guess. All Chinese names have at least 2 characters and many, maybe the majority, have 3 characters. Sometimes the transformer will transform 1 or 2 characters and leave 1 or 2 character unchanged. The end result is that if even if you have a Chinese person’s correct name you may not be able to find it in a database because someone has ‘transformed’ the name. Sometimes you can’t find a Chinese person in a database because you believe their name is written with character ‘X’ but in fact they write it with character ‘Y’. The only way to solve this problem is for the database’s search engine to ‘normalize’ the search. Here is an excellent summary of ‘normalization’ prepared by Michael CY Chan. Continuing from Part 1…. So, David gave us the 15 minute history of the genesis of his knowledge café. Basically he use to go to these KM lectures in the City and the best part was the conversation in the pub after the talking head. It’s an absolute truth that the ‘afterwards’ ‘coffee/tea breaks’ ‘meeting in the morning’ are the most useful for understanding what will, has or may be useful at a organized speaking event. Afterwards, we had the useful coffee/tea break with excellent coffee, tea and pastries. –	Ms Annie KONG, Chief Operations Officer, Print‐Rite Management Co. Ltd. The actual café was in 2 sections. One of the Make Award winners sat at a table and we first listened and then had sort of a conversation about what sort of KM activities and strategies they had deployed or were now deploying. It was a bit stilted because we needed to ‘listen’ to the winner and then respond. Each section lasted about 45 minutes. The second section was much better than the first. By the second section people knew what to expect and there had been the all-important trust established at the tables. This was a point that Nicolas had made earlier in the morning and I heard over and over again at the tables from the Award winners. There must be trust established with the employees before they would participate in any knowledge-sharing activities. The essential flaw in the programme was that we only had time for two 45-minute sections and there wasn’t enough time to establish a solid level of trust among the participants. At the end, Eva LO, Director of Knowledge Management from Langham Place Hotel said she noticed she wanted to ‘lecture’ and I could observe that in the 1st section but less so in the 2nd section. The format made the Make Award winners the ‘teachers’ and us the ‘students’. So, in retrospect it was better than the normal talking head conference but it could have been better with both more time and someway of minimizing the ‘teacher’ ‘student’ format. Maybe if there had been a general KM topic to discuss this would have enabled more open and fluid conversations. I think we all felt obligated to listen to the ‘masters’ and not ask too many questions. We ended with one of those excellent Hong Kong 8 course Chinese lunches and some good conversation. As David said in his introduction its always the ‘afterwards’ which is the best.